My poor little thumb (left) has been taking a beating at work, and after the beating it took over the semester (note-taking–how sad is that? ), it’s very sensitive. To spare it, this will be a low text entry. The Icarus is speeding along, so much as anything that has 400+ stitches per row can speed. It doesn’t look much different than it did Monday, however, so I’ll spare you a picture. Until I finish that, I will not let myself start any new projects. A little voice at the back of my mind has been coaxing me to take a break and step back, but I know it better tha that. If I were to step away from the Icarus, I wouldn’t want to go back. I would have to be forcibly dragged back to it, and that would just make a scene. So until Icarus is finished, I’m only thinking about starting other projects. 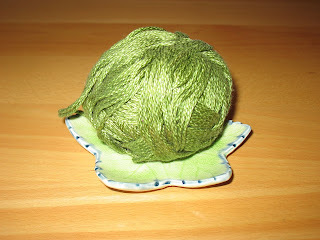 Namely stash projects, because the same little voice has been suggesting yarn purchases as well. Topping the list of destash victims is this cotton. It has been in my stash for almost as long as I’ve been a knitter, and I’ve been trying to figure out what to do with it for that long, too. I finally found the perfect project on Owl and Acorn. A string bag–free pattern, takes only one skein, and is completely functional. And let’s not forget cute. I am very much a fan of the Miss-Marple-chic. Between knitting, I have extended my definition of nothing. Bleugh. 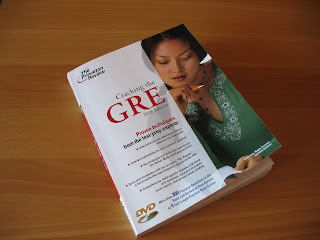 The only motivator here is that I’m signed up to take the GRE on the 28th of this month. My reasoning is that my soul has already been sold for that morning; I might as well get my money’s worth out of the sale. On a brighter note, the weather here has been gorgeous. Easter’s threat was merely that. Normally, May is like a scene out of Dante’s Inferno, but up to now, we’ve been able to have the windows open all morning, sometimes all day, with fresh little breezes puffing up the sheers with inspiring, sweet-scented air. It’s positively glorious, and forecast to last through the weekend.